For all those of you experiencing the wonderful years of raising your baby, then Carter's, online at carters.com, is the store for you. Carter's offers a wide selection of clothing for babies, toddlers, and kids. Clothing on Carter's is available from every age starting as a newborn and ranging up to 7 years old. Carter's has tops, bottoms, pajamas, footies, toys, sweaters, sweatshirts and much more for both boys and girls. So when shopping for your little loved one be sure to see what Carter's has for you. Be sure to stop by RetailSteal to find the best Carter's coupon codes, Carter's promotions, and Carter's discounts. Carter's offers standard shipping at a flat rate of just $6. Expedited 2-3 day shipping as well as overnight shipping is available as well. Carter's does not ship internationally. See website for full details, exclusions may apply. Shop at Carter's and enjoy 15% savings on any order. Click here for code. Use this coupon code today to save 25% off your order of $40+ from Carter's. Shop the sale at Carter's and save up to 60% on baby and kid merchandise. 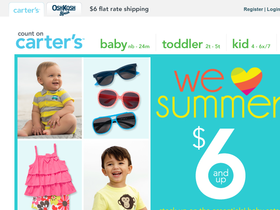 Enjoy free shipping on orders of $50+ when you shop today at Carters.com. Shop at Carter's and enjoy up to 40% savings on Halloween costumes, outfits, and pjs. Click here to shop. Enjoy up to 50% savings on all pajamas at Carter's for a limited time only. Click to save. Shop the super duper clearance section at Carter's and find items starting at just $3.99. Click to save.